Pine City, Minn. (WCCO) A 30-year-old man was killed in a kayaking accident on Snake River Sunday, the Pine County Sheriff's office said. Jason Ray of Annandale, Minn., was thrown from his kayak after he attempted to paddle it over a dam, witnesses told police. An undertow caught the kayak and shot it straight up into the air. Ray's four companions had avoided the dam and taken a portage route. They found Ray face down in the water about five minutes after the accident. Ray was pulled out of the water with assistance from rescue crews. 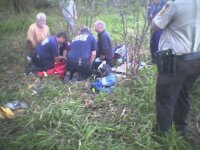 He was taken by ambulance to Pine Medical Center in Sandstone, Minn., where he was pronounced dead on arrival. The group began its journey at Voyageur Park in Pine City, Minn. at around 2 p.m. The accident occurred downriver, just east of Pine City. Officials were called to the scene just after 3 p.m. In general, the kayaking accident was due to chance, not recklessness. Jason had been kayaking for quite some time, but was still learning about white water kayaking. He often practiced rolling his kayak in a swimming pool. Jason and his cousin Bradford had kayaked the same route down the Snake River the day before, Saturday April 16. At that time, Jason had been contemplating avoiding a portage around the small Cross Lake dam by going over it. The “dam” was probably not what most people would think of upon hearing the word. It was really a sudden drop-off of only three feet. On Sunday April 17, Jason met Brad’s friend Nate for the first time. Besides Jason, the kayaking party consisted of Bradford, Nate, Judy (Brad’s longtime girlfriend), and Jason’s cousin Jenny. They set out from Voyageur Park on Cross Lake (just east of Pine City) that is part of the Snake River at about 2 p.m. Upon approaching the dam at about 3 p.m., the group witnessed other kayakers going over the it. While signs are posted prohibiting boaters from going over the dam, no such signs were visible from the water. Jason chose to go over the dam while everyone else carried their water craft around the portage. Upon going over it, he immediately fell out. However, he stood up in the shallow water as his kayak continued floating downstream. He called out to the two other men to chase down his kayak, thinking that he did not need assistance. Jason must have slipped and was pulled underwater by the massive volume of water passing over the dam, despite wearing his life preserver. When Nate and Brad heard the girls on shore crying out, they tried searching for Jason, but only caught an occasional glimpse. When they finally reached him, he may have been underwater for five minutes. They pulled him to shore and administered CPR until rescue crews arrived, within a few minutes. Jay was wearing a life jacket and was actually standing in the shallow water just over the dam, but the undertow made him lose his balance and was able to drag him under. Months earlier in the Summer of 2004, Jason came across the results of another waterborne accident, where a canoe flipped over and a young girl, Jassikay “Rosa” Cohen-Bruggeman, age 2, was trapped under a tree, despite wearing her life jacket. More details about this life-changing event can be found in Brad’s Eulogy. Jay’s life jacket was black (if you’re going to wear one, why not look cool?) and he was wearing dark colored clothes. When he disappeared, precious minutes were lost trying to find him in the black water. Remember, Riverbanks are often in deep shade. In the earlier accident, Jay had a difficult time seeing Jassikay and her mother, and had to follow the mother's cries for help. During the Jassikay incident, Jay called 911 from his cell phone, and this cemented his dedication to always having one. When his accident occurred, he was the only person carrying one, and it was rendered useless by the water. Other bystanders were able to call immediately, but this would not have been the case if they had been in a remote location. Remember that having a cell phone does not do you any good if you are unable to describe your location to Emergency Personnel. Newer phones may even have GPS location capabilities. Make sure that every member of your party knows where you are. The two friends who pulled Jay to shore were both certified and skilled in administering CPR. They were able to render immediate assistance, but were just too late in arriving (partially due to his dark colored life jacket). Unfortunately, their skills are the exception rather than the rule. Jay himself had not been certified in CPR since his Boy Scout days. Minnesota has a Good Samaritan law, where bystanders cannot be sued for offering assistance, but that is poor consolation after a tragedy. Jason NEVER drank alcohol or did drugs. However, the news report on the local Fox Affiliate mentioned that alcohol is usually a factor in waterborne accidents, implying that is might have been involved in this case. That is simply not true. But every impaired member of a party is a potential victim and a burden when an accident occurs.